The classic steel sound by an industry legend. For decades, Ludwig snare drums have been the go-to for studio and touring professionals alike. With snare drums priced in multiple categories, it's hard to know where to start. Ludwig recently introduced a new snare drum line, Supralite, which comes in at an entry-level price without sacrificing quality of sound. This drum features a 1.5mm chromed-steel shell and vintage-style tube lugs. The beaded steel shell delivers a nice crisp note and full-bodied tone throughout a wide range of tunings and the 2.3mm flanged help keep the drum focused while allowing it to breathe. Experience the new Ludwig Supralite snare today. 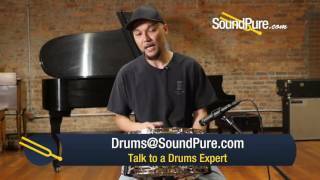 In this video, Sound Pure drums expert Barry Knain explains the various features of the Ludwig 6 5x14 Supralite Steel Snare, and tests it out in several different tuning ranges. The Ludwig Supralite Snare is a warm, versatile steel snare with an economical price point. The 1.5mm beaded steel shell provides a wide tuning range, a rounded attack with ample overtone and a classic appearance. The drum is ringed with stout chrome-over-brass lugs and 2.3mm triple-flanged hoops.